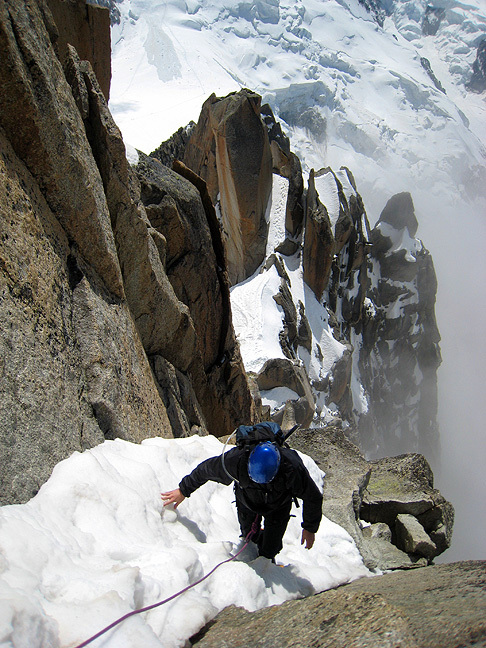 Lindsey Hall, who hails from Toronto, joined Mark for a week's climbing near Chamonix. 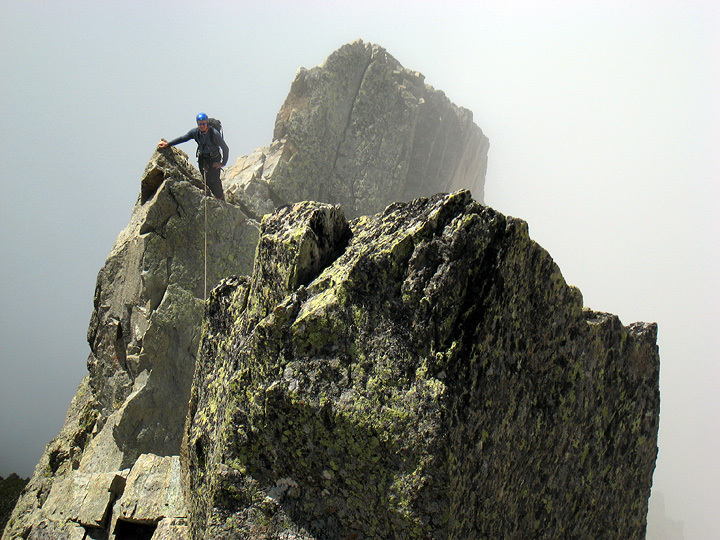 With generally good weather, we climbed the Arete des Cosmiques, the Midi-Plan traverse, Mont Blanc via the Traverse, the southeast ridge of the Aiguille de l'Index, and finally the Table Spur on the Aiguille du Tour. 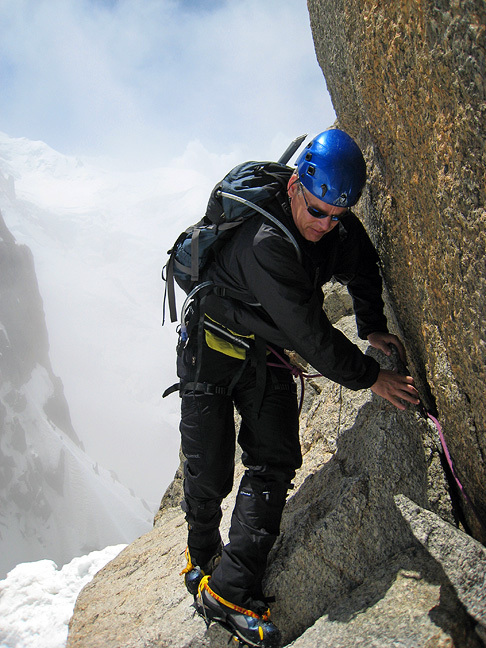 Our first climb, the Arete des Cosmiques on the Aiguille du Midi. 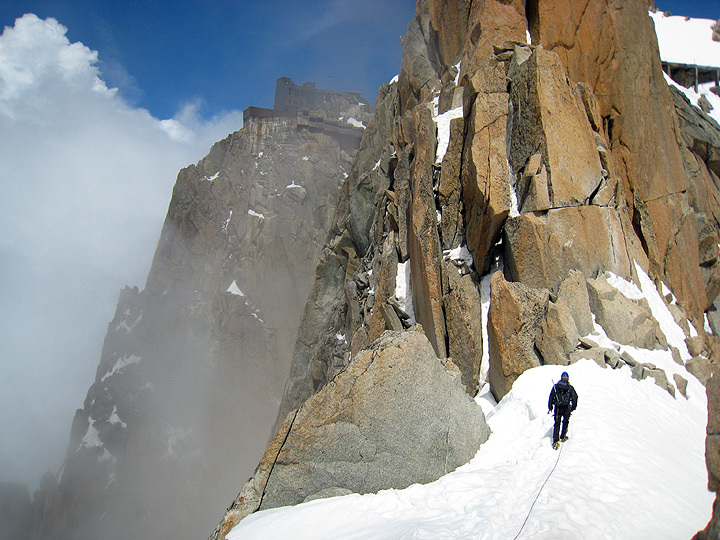 Looking up towards the summit of the Midi. Only a few pitches remain to the end of the route. 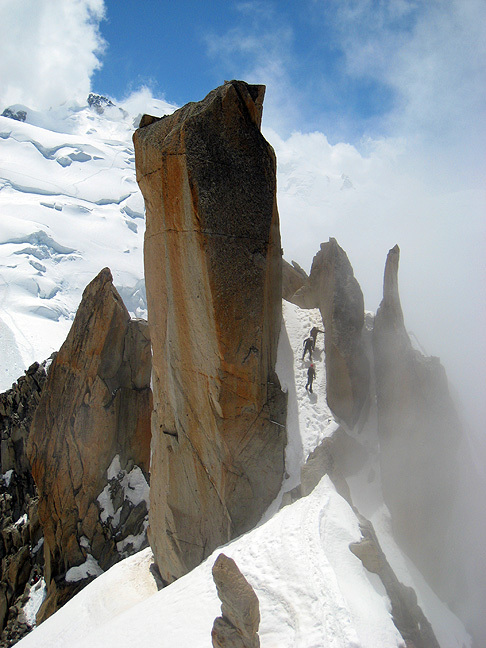 The classic view on the Cosmiques Arete. 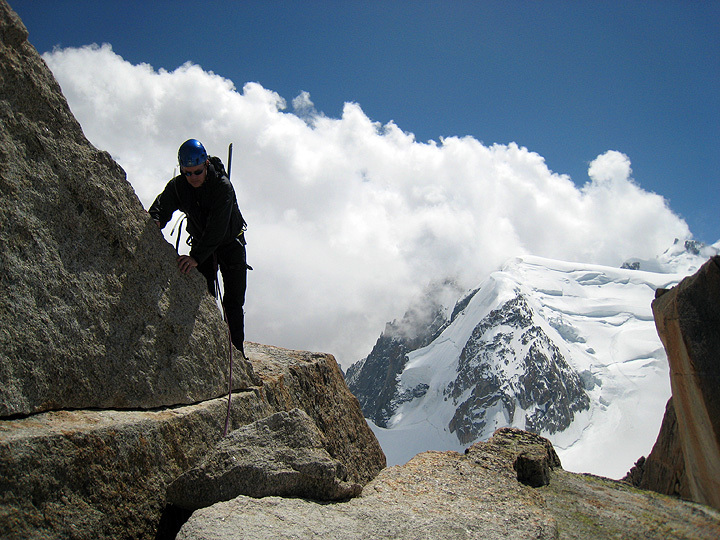 Climbing on the Arete with Mont Blanc du Tacul behind. On the last pitch of the route. 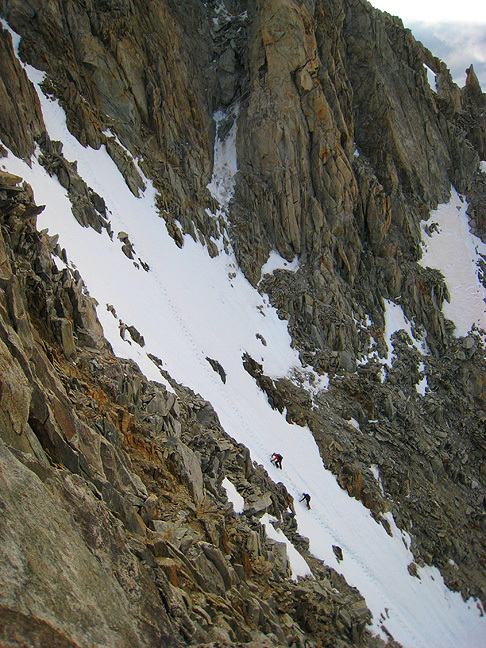 After a night at the Cosmiques hut, we had a go at the Midi-Plan traverse. 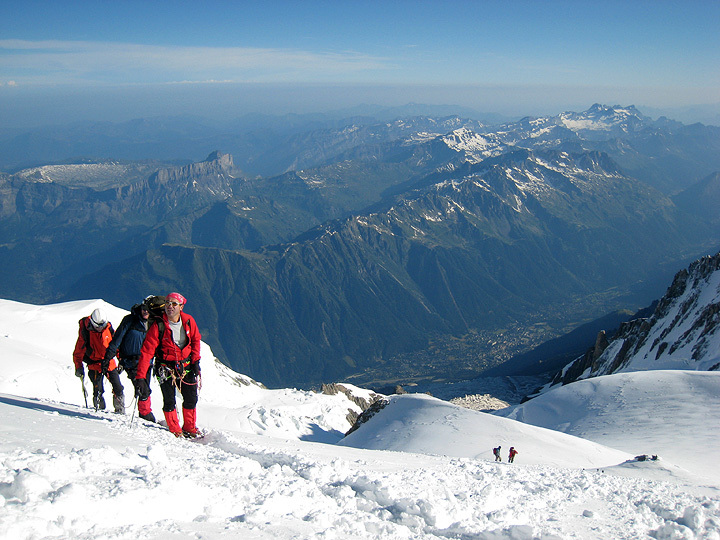 However, warm conditions softened snow too quickly and we were unable to finish the route to the summit of the Aiguille du Plan. 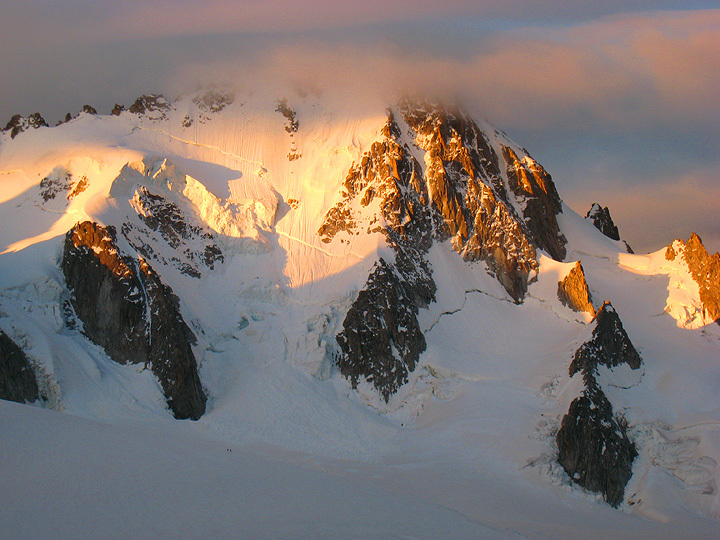 Looking back towards of the Aiguille du Midi. 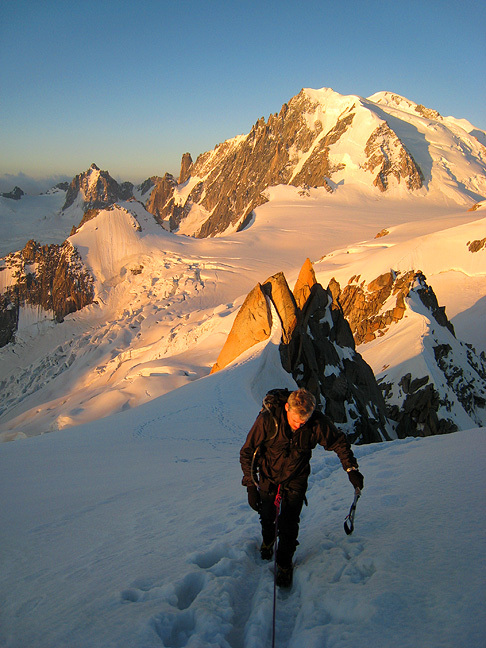 After another night in the Cosmiques hut, we continued on to Mont Blanc via the Traverse. 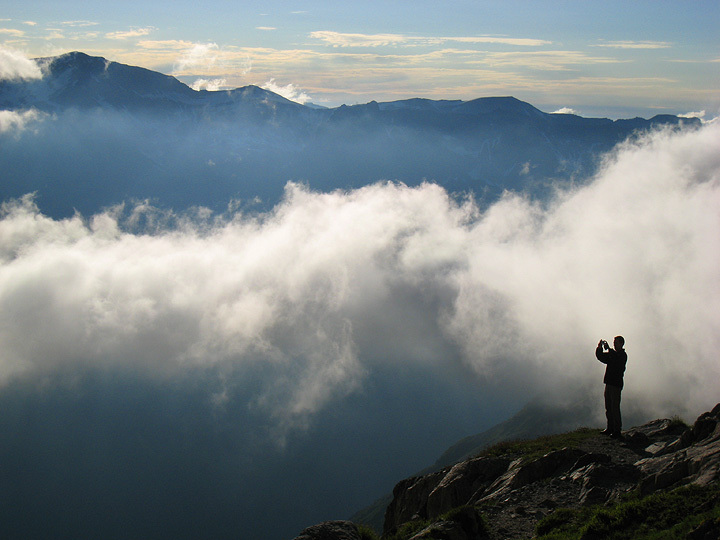 Here, we are at the Col de la Brenva, at sunrise. A bit higher on the route, at the top of the Mur de la Cote, looking east. Almost to the summit. 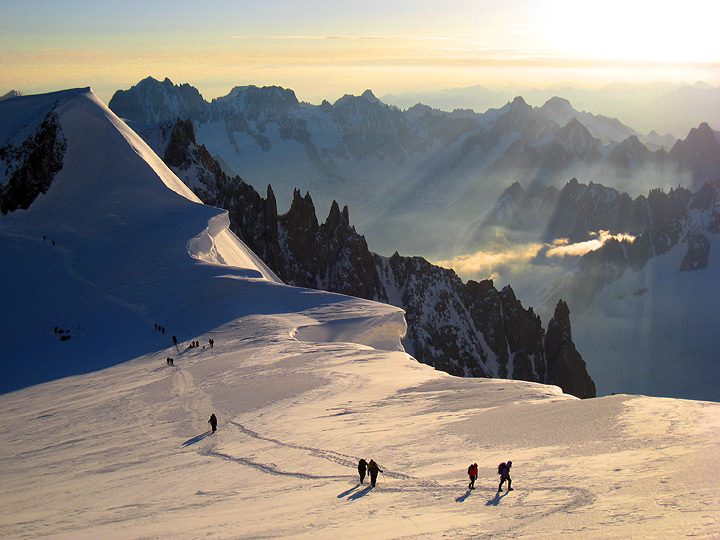 The Chamonix Valley far below. 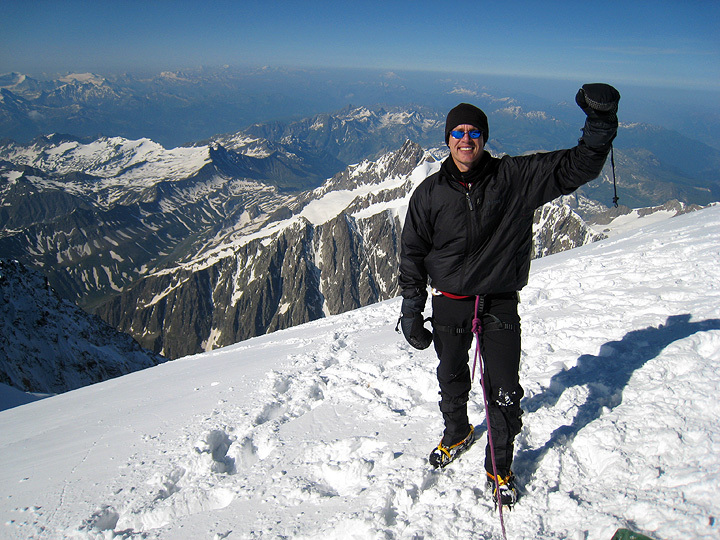 Lindsey on the summit of Mont Blanc. 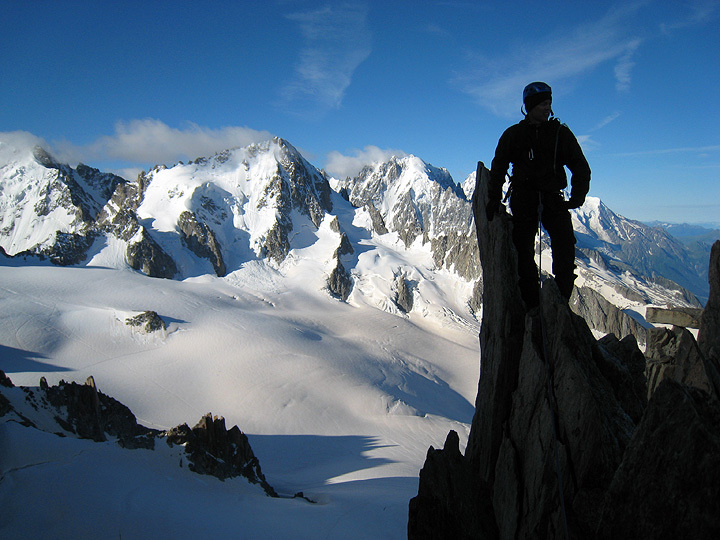 The following day, we first climbed the Southeast Ridge of the Aiguille de l'Index, then continued on to the Albert Premier hut. 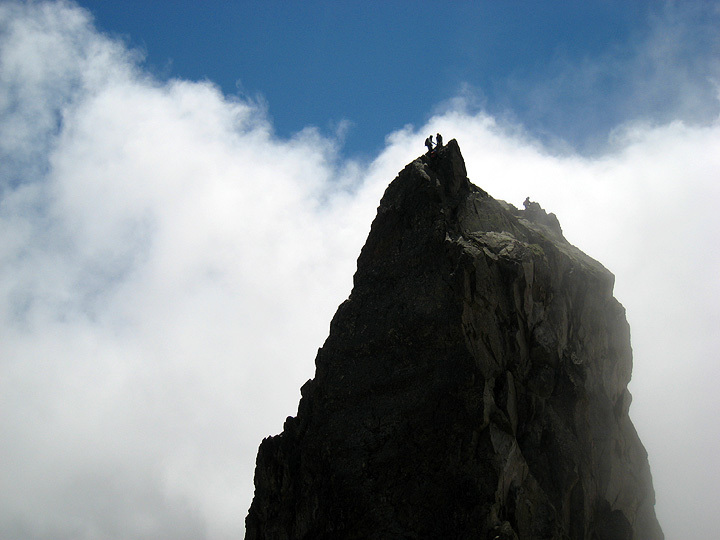 Nearing the summit of the Index. 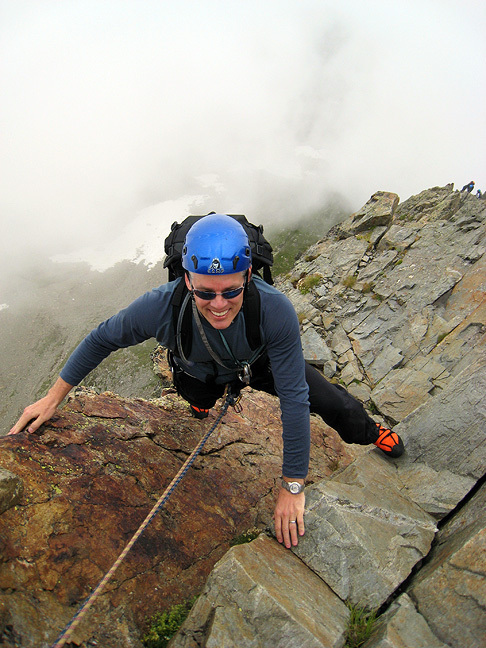 Looking back at the summit of the Index, after the rappel descent. 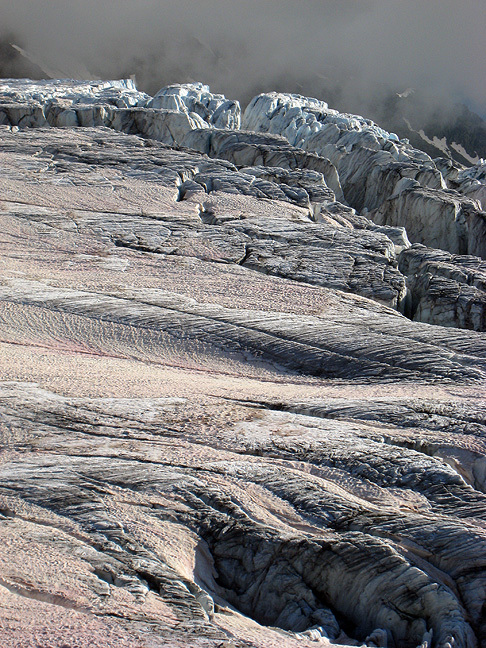 Crevasses in the Tour Glacier from the Albert Premier hut. 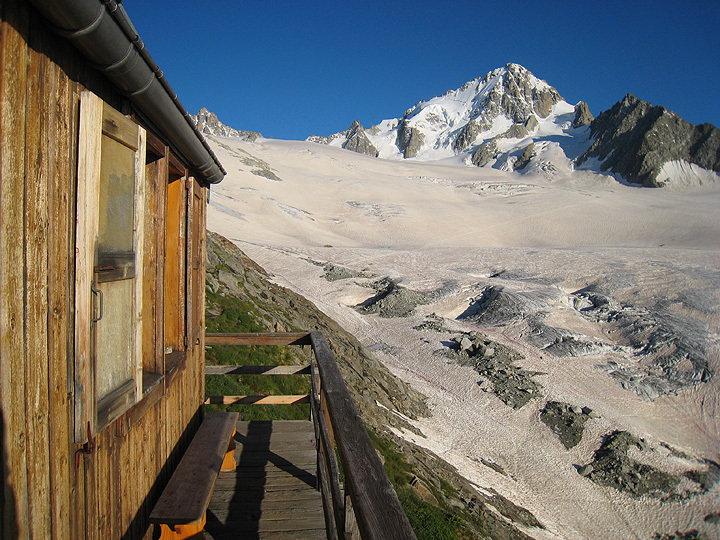 Looking up at the Aiguille du Chardonnet from the old Albert Premier hut. 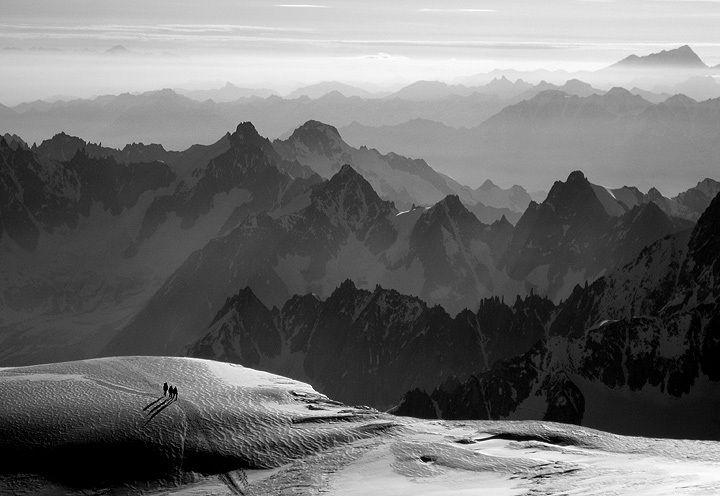 Looking out over the Chamonix Valley. 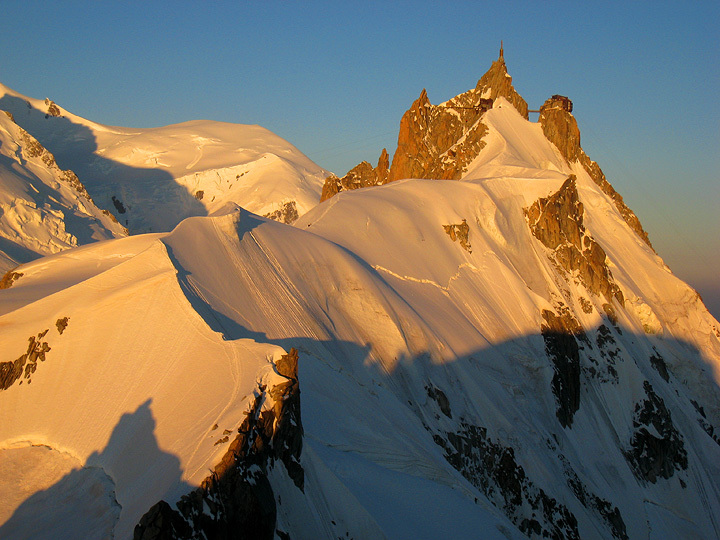 Sunrise, the following day, on the Aiguille du Chardonnet. Looking over to the Table Couloir from our route on the Table Spur of the Aiguille du Tour. Lindsey nearing the summit of the Tour. The famous "Table" can be seen behind on the right.